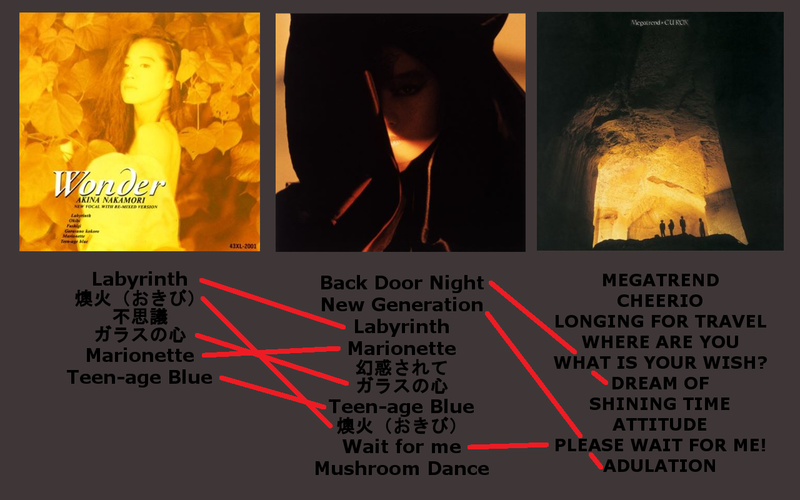 Nearly two years after Fushigi was released, Nakamori released her fifth and final Mini Album of her tenure at Warner/Pioneer. Wonder is a six track post script to Fushigi featuring clear vocals over re-recorded music. Kind of a self-cover album I suppose. The only real bummer is that by this time EUROX has basically disbanded by the end of 1987, so their participation is minimal. Immediately you'll notice that the music seems to be much more polished. Once the vocals kick in, the whole ordeal is squeaky clean. It almost defeats the point...I mean...the background singers are in the background. What kind of world is this? Labyrinth sounds just as groovy played straight. Of all of the songs on this album, I think that this is the one I actually prefer over the Fushigi album version. It sounds just a smidge faster and plays just a smidge better with the clear lyrics. Now this one is actually really interesting. It's a completely new song. This song was actually used to promote this mini album in television appearances and was part of her 1988 tour's set list. That said, it almost seems completely out of place amidst the futuristic sounds of EUROX. Where we were getting electric violins in the album Fushigi, the song Fushigi features...bird song. It's a slow song, but it's actually a damn fine one. I love the reverse dynamic here. Like Okibi, this one plays a little bit better with clear lyrics. The thing that kinda holds it back is the music itself. It kinda sounds weak compared to the Fushigi version. I don't know, the guitars just don't have that same dreaminess to them. I prefer the Fushigi version......WAY more than this. That isn't to say that this is bad, but the beat just isn't as forceful...and the singing really benefited from the almost industrial nature of the version on Fushigi. That said, this is totally listenable and is more at home with the version that Nakamori kept in her set list well into the 2000s. Of all of the covers on this mini album, the music is actually closest to the original on this track. The clear singing is actually pretty beneficial on this one as well...except maybe when she says "Teen-age blue". It sounds kinda rushed and doesn't flow as well as it does with the distortion. OVERALL: Highly...HIGHLY recommended if you're a fan of Fushigi. 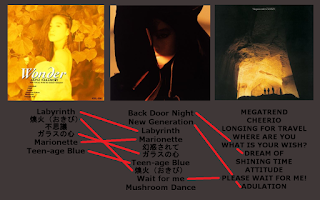 While I may bemoan the lack of Mushroom Dance and Wait For Me, this does address some of minor issues with the album versions of songs like Okibi and Glass no Kokoro. Seriously, the closest we ever got to a clean version of Mushroom Dance was from the video release of her 1987 tour. I would kill to have a clean studio version. Hell, why not a clean version of the whole album?? As I mentioned previously, EUROX is the sound behind the Fushigi album. As you might imagine, providing the music for an established singer kinda leaves a band's existing singer out in the cold. As far as I can work out, however, EUROX didn't really have a set singer. Prior to their work on Fushigi, the band released two singles in 1984 with Hiroshi Nemoto on vocals. If you coming to this album directly from Fushigi, you would almost expect to hear Nakamori's distorted vocals right off the bat. The titular track from this album is a nice reassurance that EUROX hasn't changed one bit in the time since their work on Fushigi. MEGATREND in particular is an awesome song. This one might have been a little out of place had it been part of Fushigi as it's played pretty straight-forward. This song is just a little more mainstream and slick versus the album industrial sound from Fushigi. That said, it's definitely a EUROX song. A slower song. One that kinda ditches the electronics in favorite of just making a chill song. The funny thing is, it's kinda sung in the style of Fushigi. Lots of random vocalizations ("Ah-Ah") and vocals that aren't 100% clear. Sure, they can all be understood, but there is a light masking to the whole thing. 05. WHAT IS YOUR WISH? Well now...this sounds awful familiar. The music here is a 1:1 recreation of Back Door Night from Fushigi. Naturally the only difference between the two songs is Isamu Hasegawa's clearish vocals instead of the heavy distortion used throughout Fushigi. The only weird thing is hearing it midway through an album instead of it kicking the whole thing off. This is the only song I don't really dig all that much. After a minute-long intro of really just nothing in particular, the song kinda picks up and doesn't do a whole lot...until it does... Two thirds of the way through it suddenly becomes a different song and just sounds...messy. This song is weird in a less desirable way. A slow song done right. I enjoy this one, especially the piano work splashed in at some points. 09. PLEASE WAIT FOR ME! This is a 1:1 cover of New Generation from Fushigi. The only real difference outside of the singers is the intro is a little drawn out. Honestly, it still sounds great here. This and the following track were never part of MEGATREND, but were from one of the only singles that EUROX released while they were signed at Warner/Pioneer. So while MEGATREND was released in 1987, the single for COLD LINE and OUT OF CONTROL were released as bonus tracks. Thanks, Warner... That was cool of them. As a result of this being older, it features original EUROX singer Hiroshi Nemoto. Ehhh, this song is OK. The only thing that really holds it back in my opinion is the Faux-Simon Le Bon from Duran Duran singing. EUROX was always a great band, but the lack of a consistent singer early on seemed to bring them weird places. One of those was Nakamori, so I can't complain. I want to like this one, but the singing is just weak. This song is just...all over the place. Yeah, I don't like it. It just sounds like a lot of early 80s nerd rock that I hate so much. OVERALL: I highly recommend checking this out if you're a big fan of Fushigi. I honestly recommend this over the Wonder mini album. While both MEGATREND and Wonder kinda unmask all the makes Fushigi special, MEGATREND acts as the better supplement. As a standalone album, MEGATREND is a great listen. In a world where Fushigi exists, I don't understand how this didn't become a bigger thing. In a world where Fushigi never happened, I can kinda understand how this wouldn't become popular. I never would have heard it, that's for sure. It has a curse of being far too technical while not really pop enough like, I don't know, Kome Kome Club. I'm on a never-ending quest to discover all of the good music I can. The EUROX sound is up there with TM Network in their richness of sound, but they never really had a hit. It doesn't help that neither MEGATREND nor Fushigi had a single. From here the EUROX story kinda fizzles. They broke up after MEGATREND's release, but continued to work with Nakamori through 1988 on awesome singles such as TATTOO and the highly underrated I MISSED "THE SHOCK". They did get back together for a little while in 2009 to release some new music, but I'm going to be perfectly honest and say that I haven't checked it out. From where the cave in the second image came from? I have no idea. It's a neat looking place, though.